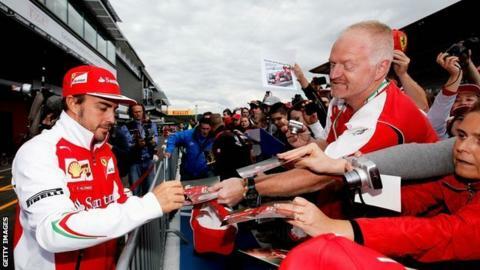 Ferrari's Fernando Alonso says he wants to extend his contract beyond 2016 despite enduring a frustrating year on the circuit. The Spaniard, 33, has been with the Maranello-based team since 2010, but has not won a race since May last year. Alonso is a target for McLaren, but says he has no desire to leave Ferrari and is in negotiations over a new deal. "Talk of other teams has never come from me, it's always the opposite," the two-time world champion said. "I think since last summer there have been stories and news almost all the time so it's now been going on for a year." He added: "It's not nice, because it creates a bit of stress and it means it is disruptive for me, the fans and for the people in the team. "However, on this topic, it's a year now that I've been saying I want to stay at Ferrari and extend my contract. That's my wish." Alonso is contracted for a further two years but has been frustrated by Ferrari's continuing inability to provide him with a car that can compete with the dominant Mercedes duo of Nico Rosberg and Lewis Hamilton. Alonso has been on the podium twice in 11 races, with his best result second at the Hungarian Grand Prix in July. He finished seventh at the Belgian Grand Prix last time out and is not confident of challenging for victory at this Sunday's Italian Grand Prix - Ferrari's home race - but has seen enough positive progress to be confident of a brighter future for the team. Alonso added on the Ferrari website: "This year has definitely been the toughest in the five I've been with Ferrari, in coming to Monza in greater difficulty and without having a really clear idea of what the race can hold for us. "In other years, we were fighting for the title or a podium was definitely within our grasp or maybe even a win. "This year however, it's all much more up in the air and there is no certainty as to what we might be able to do. "For 11 races now we have been fighting to sort out the situation and become more competitive and I think we have done that. "I would say the progress is visible."